Archival documents and extant garments are invaluable for this project, as they will help us to uncover the different fabrics, styles and colours that featured in the clothing and accessories people owned and wore between 1550 and 1650. Also critical for our research is developing an understanding of how knowledge about fashion and dress was shared and spread between people, groups and regions. Over the course of the sixteenth century, and into the seventeenth century, printed texts became widely available and inexpensive, making this an increasingly popular means of communication. Most important for this project are printed sources such as costume books, which depicted people and their clothing from around the world; ‘books of secrets’ providing recipes for beauty treatments; conduct books, which explained how particular people should dress and comport their bodies; and manuals offering various patterns for embroiderers and lace-makers. These kinds of popular prints could be found in shops and attained through street sellers in cities throughout northern Italy, often at a low price that was affordable for many people. 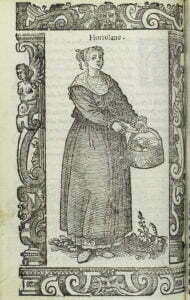 For example, the slim volume Ricette singularissime, published in 1546, gives instructions and recipes for a wide range of health and beauty treatments including making one’s hair and beard black, removing a stain from wool, mixing the finest ointment, creating scented oils and turning straight hair curly (as well as for making invisible ink, putting horses and dogs to sleep and preventing lice outbreaks). Works like this translated ‘secrets’ previously recorded in Latin into the vernacular, offering a much wider audience access to recipes and instructions they could use to improve their health and physical appearance. Similarly, there were many popular texts available for those interested in making lace and working in embroidery. Importantly, and unlike with books of secrets, the users of these kinds of texts did not necessarily need to know how to read. 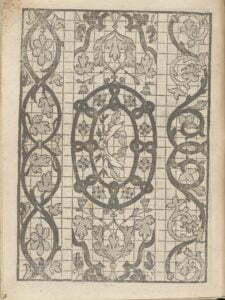 The Lucidario di recami (Venice, 1563), for instance, provides patterns for different kinds of cutwork and lace without written instructions. Those using pattern books could make lace and embroidery to sell, but also to embellish their own clothing, accessories and linens, adapting them to achieve a particular look or follow a certain style. As these two examples suggest, cheap print written in the vernacular enabled a ‘do-it yourself’ culture to develop around health, beauty and fashion. Following a pattern or recipe, artisans and members of their families could make lace to decorate a collar or change their hair colour according to what was fashionable at the time. Another important part of this project will be to investigate some of the practices that both men and women were engaging in at home as part of their efforts to dress fashionably or achieve a certain look. Indeed, this will bring together all of the strands of research, drawing on print culture, inventories, physical objects and more to try and recreate an artisan’s experience of getting dressed in the early modern world. 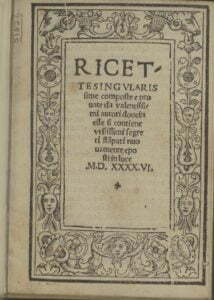 Title page to Ricette singularissime composte e provate da valentissimi autori dove in esse si contiene utilissimi segreti stampati nuovamente (place of publication unknown, 1546). The Wellcome Library, London. ‘Hortolane’ from Cesare Vecellio, De gli habiti antichi, et moderni di diuerse parti del mondo libri due (Venice: Damian Zenaro, 1590), 150v. Bibliothèque nationale de France, Paris. Iseppo Foresto, Lucidario di Recami (Venice: Jeronimo Calepino, 1564), 10r. The Metropolitan Museum of Art, New York.